Someone once told me a writer should act like a key which opens the door to another world. While I rather like the analogy it’s my understanding that a writer needs to do more than simply provide a key. Having means to unlock a door simply isn’t enough; you need something to tempt the reader inside. A photograph is a flat rendering of a captured scene but we trust its reality. However, engaging with a story isn’t simply a matter of ‘beam me up Scottie’ and you arrive in another time and place, stories require you to step inside the world of imagination. Writing is an infinitesimal spell created out of words and wonder, therefore entering a story requires a certain leap of faith. No matter how well written, or finely observed, nothing in a book will live if the imagination doesn’t commit wholeheartedly to its magic. Therefore, I believe, the business of writing stories is tantamount to being a magician who conjures with imaginings – an imagineer. Without imagination not merely stories die, imagining provides a ratchet to our soul. It isn’t so much dancing in the rain as feeling the water on your face and not getting wet. Isn’t that truly magic? The original copy which comprises newspapers bound into a book. For thirty years a strapping Victorian bible of a book has sat in the corner of my office unopened and unloved. It’s so ungainly it never fitted on any bookshelf and over the years has variously seen service as a flower press, a prop or a step (by shorter members of the family). It was given to me by my late brother-in-law as a gift when we first moved to Cumbria, in 1982, and I clearly remember how excited he was after discovering it in a second-hand shop in Carlisle. At the time I was knee-deep in knitting a new way of life having moved hundreds of miles from known friends and family so I’m ashamed to say I gave the tome a passing glance and a vacant ‘thank you’. Last month, when the floor space in my office reached critical level, I decided I must de-clutter. What’s the point of having any book if it isn’t going to be read? Luckily I resolved to honour my brother-in-law and explore the contents of this heavyweight, prior to its being ejected. 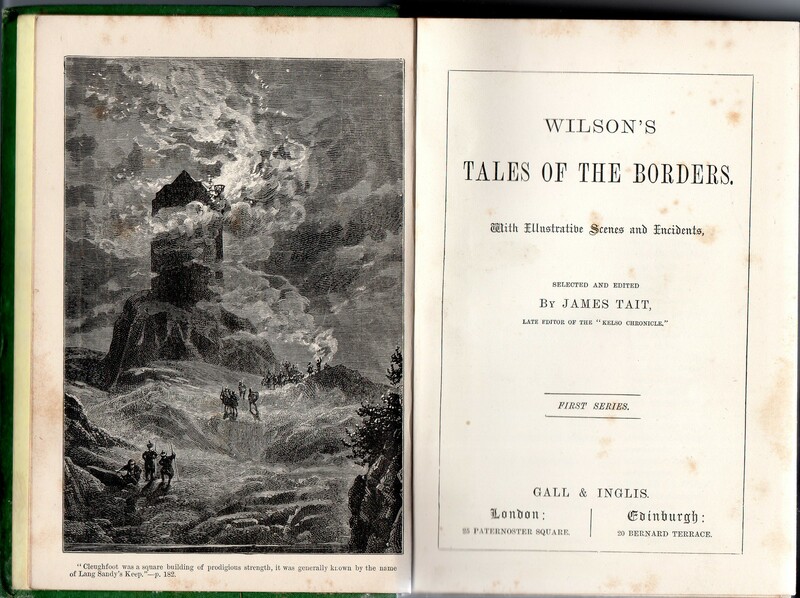 Wilson’s ‘Historical, Traditionary, and Imaginative Tales of the Borders and of Scotland, Vol. IV’ isn’t bedtime reading. Apart from mammoth proportions its antique typeface and generally archaic form of writing requires an excellent light source and active attention span. But what treasures lie within. Wilson collected these stories at the beginning of the nineteenth century. Many are folk-tales and handed-down histories, but critically some are based on interviews with ‘interesting’ local characters and the author has a comforting, if not fully objective, style. Researching Wilson I discover he was born in 1804, in Berwick-on-Tweed, and became involved in publishing at the age of 11. The year was 1815, the Napoleonic wars had just come to an end and this tenderfoot decided to go out and interview some local veterans about their experiences. From that seed his quest to record the traditions, tales and history of the region grew. The tales were first published in monthly instalments from 8th October 1834, by which time John Mackay Wilson had become editor of the “Berwick Advertiser”. They became a minor publishing sensation with an original run of 2,000 having to be raised to 30,000 within the year. Although Wilson died prematurely, on 3rd October 1835 at the age of 31, he’d already contributed 66 tales to the first collection and the success of his idea led his executors and family to continue the process of publication. They recruited a group of contributors to continue the work and a total of 299 were eventually published. The roll-call of writers influenced by these works includes Sir Walter Scott (who published smaller, portable editions in 1869), RL Stephenson and Sir Arthur Conan-Doyle. Each story radiates with the rich history, lore and legend of the Borders. They caught the imagination of their age and offer a rich social history covering some 500 years. I’ve copied out the opening paragraphs of one story which captured my attention. It recounts the exploits of a man called Bill Whyte as told by his gypsy brother. ‘I was born, master, in this very cave, some sixty years ago, and so am a Scotchman like yourself. My mother, however, belonged to the Debateable Land, my father was an Englishman, and of my five sisters, one first saw the light in Jersey, another in Guernsey, a third in Wales, a fourth in Ireland, and the fifth in the Isle of Man. But this is a trifle, master, to what occurs in some families. It can’t be now much less than fifty years since my mother left us, one bright sunny day, on the English side of Kelso, and staid away about a week. We thought we had lost her altogether; but back she came at last, and, when she did come, she brought with her a small sprig of a lad, of about three summers or thereby. Father grumbled a little – we had got small fry enough already, he said, and bare enough and hungry enough they were at times; but mother shewed him a pouch of yellow pieces, and there was no more grumbling. And so we called the little fellow, Bill Whyte, as if he had been one of ourselves, and he grew up among us, as pretty a fellow as e’er the sun looked upon. I was a few years his senior; but he soon contrived to get half a foot a-head of me; and, when we quarrelled, as boys will at times, master, I always came off second-best. I never knew a fellow of a higher spirit; he would rather starve than beg, a hundred times over, and never stole in his life; but then for gin-setting, and deer-stalking, and black-fishing, not a poacher in the country got beyond him; and when there was a smuggler in the Solway, who more active than Bill? He was barely nineteen, poor fellow, when he made the country too hot to hold him. I remember the night as well as if it were yesterday. The Cat-maran lugger was in the Frith, d’ye see, a little below Carlaverock; and father and Bill and some half-dozen more of our men, were busy in bumping the kegs ashore, and hiding them in the sand. It was a thick, smuggy night; we could hardly see fifty yards round us; and, on our last trip, master, when we were down in the water to the gunwale, who should come upon us, in the turning of a handspike, but the revenue lads from Kirkcudbright! They hailed us to strike in the Devil’s name. Bill swore he wouldn’t. Flash went a musket, and the ball whistled through his bonnet. Well, he called on them to row up, and up they came; but no sooner were they within half-oar’s length, then, taking up a keg, and raising it just as he used to do the putting-stone, he made it spin through their bottom, as if the planks were of window-glass; and down went their cutter in half a jiffy. They had wet powder that night, and fixed no more bullets. Considering the Battle of the Nile took place in 1798 this ‘interview’ is with a man born in the late eighteenth century yet phrases like ‘small fry’ and ‘half a jiffy’ sound relatively modern. But it’s the stirring eye-witness accounts which make such stories relevant. Strip away Victorian sentimentality and the intimate, chatty style adds credence, just like Michael Parkinson interviewing a celebrity, I feel I’m listening to the past through a key-hole. Why do people read – it isn’t as if it’s compulsory, at least not once you’ve abandoned school for the real world. And yes I do know some people who will do anything to avoid reading and blame it on lack of time. It seems fair to say we are bombarded with information without the need to resort to books. Yet some of us still prefer to read, to actually explore the words as written on a page, and imagine…. It isn’t as though reading comes naturally. Cave men began with pictures; language and writing are relatively recent in evolutionary terms. And there are some races who never took to writing, like the Celts, who still blame Anglo Saxons for inventing it as a tool of state. Celtic people embrace the old ways – stories told in company, by a professional storyteller. What’s not to like about gathering around a roaring fire with a beaker of ale (or whisky even) listening to what might have been? But nowadays the medical profession is constantly willing us to exercise more and be couch potatoes less. I say disregard the dangers and read anyway. In the real world you only live once but delve into fiction and you can live a hundred lives. And if you operate in a time-hungry ethos try reading short stories (particularly flash fiction). 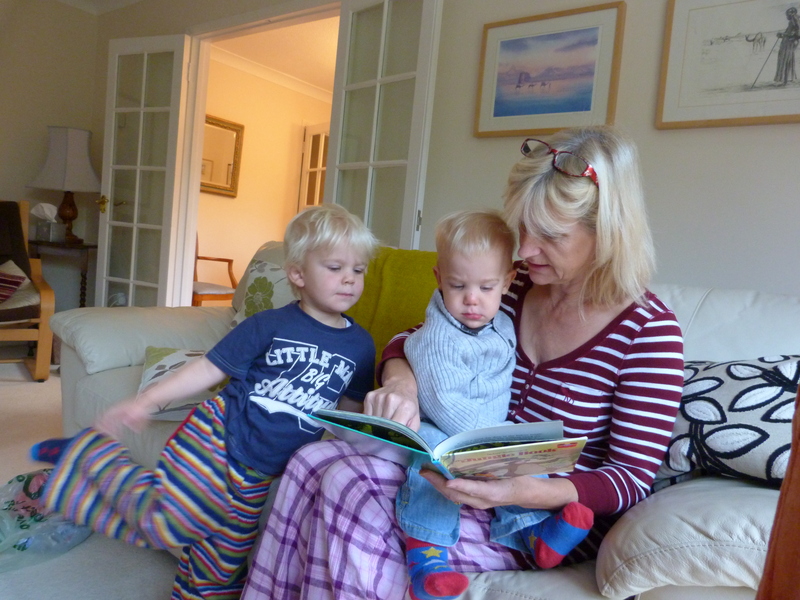 You might manage a reading break without feeling guilty? What wealth there is in imaginings.